Are you in a rut? Is your rut related to your lack of movement therapy or what I call intuitive movement? Or are you in a mental rut? Is your spirit dead? If your answer is "yes" to any of these questions, I will take you on a journey that uses the physical metaphor of gliding. As you shall see, gliding for body-mind-soul fitness may just your ticket to get you out of your ruts. When you learn what is a metaphor and how metaphors apply to your life, your whole being is elevated to a whole new level. You become open and honest with yourself and a new dimension in healing is possible. 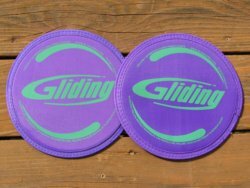 I chose gliding discs, because they are perhaps the simplest, cheapest but most fun little gizmo that I have found for agility training, toning, aerobic and core exercises. I am always searching for interesting and new ways of being through body movement. 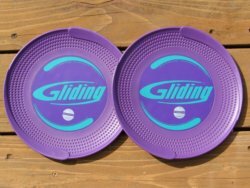 I fell in love with the gliding discs and hope that you do too! You can make the exercises simple enough for the elderly or most difficult for the hard-core trainer. Plus the gliding discs are perfect travel companions. They are flat and fit without a hitch into your suitcase. In fact, you don’t even need gliding discs. You can use plastic plates or paper plates, depending on the surface you choose to use. They are a bit harder to manage, but as you shall see in my videos (scroll to bottom for video links), plastic plates especially, are quite doable as my 80+ mother-in-law demonstrates. 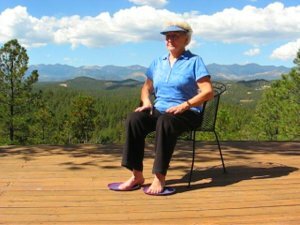 When you chose your gliding discs make sure you pick the right one for the surface on which you plan to practice your gliding exercises. There are plastic gliding discs for use on carpeted floors. If you have a hardwood or tile floor, the best gliding discs are softer and flexible and made of a canvas-like fabric. You can wear sturdy work-out shoes or not. I prefer the added sensory input from my bare feet. Do what ever YOUR heart desires, as you experiment and try different things. Just plant the balls of your feet or the palms of your hands, with fingers spread out, firmly in the center of the gliding discs and go! In spite of all the benefits listed above, gliding exercises are really fun! You can turn any aerobic dancing or aerobic exercise into a bigger challenge by just putting the gliding discs on your feet! Or kneel down and put them on both your knees AND your hands and see the fun as you move around the floor on your hands and knees. It will really make you feel like a kid again! And for all you strength trainers, wait till you see the moves that can be done to strengthen your core, not to mention your upper and lower body. For overall fitness training, the lowly gliding discs pack a big punch! The gliding discs are truly the best travel work out equipment. You no longer have to look for hotels with fitness centers with shabby free weights and treadmills, because the gliding exercises can produce aerobic activity as well as strength training. The stabilization muscles utilized with the gliding exercises vastly increases the strength needed to perform the exercises, just like we learned with the bosu balance trainer. Our senior citizens can benefit by simple movements as you can see in gliding exercises for seniors. Simple gliding movements will dramatically increase their range of motion. See all my gliding exercises below, to see how easy are the simple gliding discs yet how dramatic the results can be. As with all body movements, I believe that you can take gliding exercises to a whole new dimension. I have discussed in my foam rolling series, just how useful a tool the foam roller is, to determine where you hold your stress and tensions. The metaphor of held physical tension determines where your inertia lies. We all manifest stress, pain and suffering in certain parts of our bodies, unique to us. Like Walt Whitman, let us now move beyond the ordinary physical exercise of the gliding discs and glide into our own inner space to the place where we can discover more about ourselves. When you do the gliding exercises that I list below, really try to feel your body and where it is in space. Feel how your body moves, in relation to your center or core. The "core of your being" is important, as I discussed in core exercises. Knowing where your center is as you move is the single most important metaphor of all. Staying centered is extremely important with physical fitness, as well as your mental and spiritual fitness. Keeping your focus on your center (core) and engaging it while doing these gliding exercises will really increase your performance. As you sense your body in space, sense where your congestion or your tension lies as well. Where is your range of motion limited? Where are you stuck? Is it merely physical or it it mental and spiritual as well? As you glide, focus on making your movements free, easy and smooth. Meditate on ease and flow to remove your body-mind-soul limits! Say freely and often: "My body, mind and soul flow with fluidity and ease. I am free!" The best way to center yourself when performing your gliding exercises is to focus on your breath. Notice how you hold your breath when something gets difficult. Intentionally breathe slowly in and out while performing the exercise. Try to perform only to the extent that you can breathe comfortably without using your mouth. If you force yourself to only use your nose to breathe you will have to go slowly. This type of breathing signals to your parasympathetic nervous system that you are not stressed. It means that you are not in the fight or flight mode, but the relaxed, body-mind-soul mode. This type of breathing is what is done in Yoga and really helps you connect your body and yourself. Your may wish to breathe like Dr. John Douillard teaches, a chiropractor and Ayurvedic medicine practitioner out of Boulder, Colorado. I have had the fortune of hearing him speak and his training methods are proven effective. After reading his book, Body, Mind, and Sport: The Mind-Body Guide to Lifelong Health, Fitness, and Your Personal Best, I learned techniques for breathing during exercise to minimize effort while still improving performance. His 'Darth Vader' breathing technique is effective and changed the way I approach exercise forever. Dr. Douillard’s breathing technique is similar to the medical technique of pursed lip breathing used for energy conservation in patients who have chronic respiratory difficulty. It works for respiratory patients to reduce their stress and the energy required for breathing and it will work for you. You can simplify yourself through your workouts, for better and more efficient breathing. This type of breathing is totally foreign to most fitness enthusiasts. They believe that if you are not panting out loud that you are not getting an effective workout. I disagree. 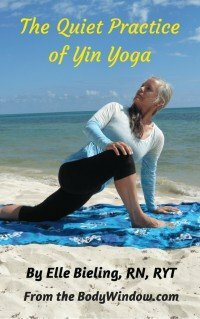 Yogis easily live to be over 100 years old, and they do not emphasize any physical exertion for health that involves panting. As I age, this relaxed, flexible, strong and mindful movement is way more attractive to my joints, my muscles and my entire body-mind-soul than the stressful panting involved with most aerobic activity. I no longer beat myself up through exercise to achieve merely a physical goal. Is it any wonder that the average Joe/Jane fails to keep a stressful exercise program going! Let us instead, stay centered on our breath and on our movement as we glide into a better way of being when we use our gliding discs! If you stay centered and breathe comfortably while pushing your edge just a bit, your fitness and aerobic capacity will improve. Then, you just might stay with it! When you use your gliding discs, really try to glide out of your usual comfort zone. As you get better doing the gliding exercises, go a little farther as you glide where you haven’t ever glided before! Like Yoga, sink a little deeper with each exhale and glide farther into the move or the pose. Go intuitively where your body longs to go. Trust yourself and your movement and make the movement an intuitive movement. Never go so far that you feel pain. Never listen to anyone that tells you to push through pain. That is just bad advice. Pain is a warning signal to you that you are doing something wrong, so please listen to the pain! Your body has more wisdom than your brain! Gliding exercises that move into yourself simply means to focus on the rhythmic motion of a fluid body in the present moment, that is connected with itself and all of life! It is the sheer enjoyment of moving in a controlled manner as you stretch your strength and flexibility and add stabilization to the movement when the gliding discs provide a more unstable surface. It is feeling your strength and your power. What a wonderful feeling. Compare this to a feeling of drudgery, pushing and panting that most exercises entail. When you use your gliding discs, ask yourself: Where am I stuck? Where is my lack of flexibility? Am I fluid or is my range of motion catching in a certain spot? What would a fluid lifestyle look like to me? What would a fluid body look like? Am I willing to give up my patterns to become fluid and unstuck? Am I physically stable? Am I able to stretch myself beyond my usual patterns? Do I glide well? Do my joints and muscles glide? Do I glide through life well? How can I do my gliding exercises to improve my way of being? Are my joints and muscles stagnant? Where is my life equally stagnant? If you would like to learn the metaphorical meaning of each body part, and why you may be stuck in your shoulders, hips, knees, etc, you may wish to visit my foam rolling pages. Each of your affected body parts carries significance for you and your pattern of behavior. It is how you carry your emotions and your baggage in your body. You can deny aspects of yourself, but often your body tells a different story! When you make changes in your physical body, the improvement will spill over into all aspects of your life. The fluidity that you gain as you learn these gliding exercises will help you get unstuck. The ruts that you create in your life are there for you to change. You can start moving the energy physically first as you meditate on how you will change your energy to become unstuck in your emotional, mental and spiritual life as well. Allowing your body to guide you out, is how I like to put it. As you glide, say: "My body, mind and soul flow with fluidity and ease. I am free!" May you enjoy your gliding discs as you learn the powerful metaphor of physically gliding for strength, fluidity and flexibility. May these gliding exercises truly get your energy moving to change your body-mind-soul toward more fluidity and for becoming unstuck!